Bigger engine and a revamp, yet the sporty 3 remains much the same. The notion of what is and what is not an all-new design is getting harder and harder to pin down. 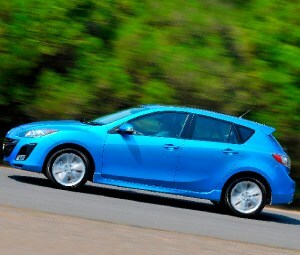 Take, for example, the Mazda 3 SP25. It’s an all-new design in that the bodyshell uses different grades of steel in different places and not a single body panel is interchangeable with the previous model. But beyond that, the five-speed automatic (dubbed ‘Activematic’) gearbox is a carry-over from the previous 3 range, and while the engine has been both bored and stroked, it’s really just the old 2.3-litre mill with bigger slugs and a longer-throw crankshaft. Then there’s the footprint. See, even though the steel is new, the actual wheelbase and track is the same as the old car. The suspension is more or less carry-over, too, which means – in a rather large nutshell – that the new car feels rather like the previous one. The new front end offers a bit more grip (you’ll need a back-to-back drive to pick it) and there’s allegedly less NVH (though tyres vary on different models, which makes proper analysis difficult). Under the bonnet, there’s an extra 7kW and 24Nm on offer, for a total of 122 and 227 respectively, but the new car’s extra 40kg has pretty neatly blotted this advantage out. Of course, had the old Mazda 3 SP23 been a complete dawg this would be a tragedy, but that one wasn’t, so this one isn’t. Though the SP25 isn’t the clean-sheet thing it may’ve been, it’s still a damn good warm hatch, if not quite a hot one. Actually, had the new car been an all-new design, Mazda would have done itself a disservice by making it so aesthetically similar to the previous model. So, as it stands, the new car is an evolution, not a revolution. Cynically stated, the new design is a reskin with a few driveline tweaks. But it manages to move the game on a little, particularly around the front end. And yet it still manages to look like a Mazda 3, which is certainly no criticism whatsoever. It’s quite a big car, too, and while 17-inch alloys can look roller-skatey on some hatches, the SP’s generous wheelarches swallow them without making things look disproportionate. Inside, it’s even classier than ever, with soft-touch materials everywhere and a level of tactility, fit and finish that smacks of Japanese quality. Mazda’s 3 still sells strongly even after half a dozen years. So the new range sticks with a proven hierarchy, starting with the Neo and working through Maxx, Maxx Sport and the SP25. The brain-out MPS is coming, but it won’t arrive until the second half of this year. Standard kit looks good, with cruise and dynamic stability control loaded on every variant, and sat-nav and Bluetooth standard on all versions north of the base-model. In fact, the only thing missing in the entry-level car is the full six air-bag treatment.